Commercially grown fruits are some of the most pesticide-ridden foods available in the supermarkets. Apples and strawberries in particular have more pesticides sprayed on them than most other fruits and vegetables. Organically grown fruits are grown without the use of harmful chemicals. They are much better for you; they contain more vitamins and minerals than commercially grown fruit and have a much lower impact on the environment. And they taste better too! Organic gardening follows the simple principles of feeding the soil, encouraging wildlife on to your plot to help control pests, and companion planting to ward off pests and diseases. Artificial fertilisers break down the humus content of the soil in the long run, leading to loss of nutrients and soil erosion. To grow properly, plants need a healthy soil with plenty of nutrient-rich, organic matter (humus), and a healthy population of worms, which feed on the humus and break it down. This increases the number of nutrients available to the plants. Ways to increase humus content of the soil include adding plenty of well-rotted animal manure and garden compost, and sowing green manures. The best manures to use include those from horses, chickens and bats. Fresh manure can burn plants (especially chicken), so it’s important to let it rot down for at least six months first. Simply pile the manure in a heap and cover with tarpaulin or plastic sheeting and leave. When it’s ready it will be crumbly in texture and free of any smells. Then mix the manure into the soil when forking it over. 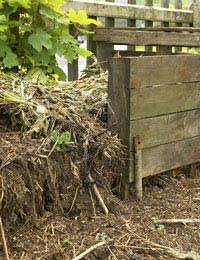 Making your own compost is a great way of returning what you have taken from the soil. All kitchen and garden scarps can be used, and there should be an even mix of green and brown waste. Meat scraps and cooked food should be avoided as they can encourage vermin. Make or buy a compost bin and place it in a sunny position so it heats up quickly, on bare soil so worms can reach the waste easily. Add the scraps and turn the heap over regularly with a fork. This aerates the heap and helps it break down quicker. It should be ready to add back to the soil in three-six months. Green manures are quick-growing crops that are grown to cover bare ground that can be dug into the soil to increase its nutrient levels before planting. Encouraging wildlife to your plot is important in organic gardening because it helps keeps pest populations in check. Hedgehogs and frogs, for example, eat slugs, and ladybirds and lacewings eat aphids. It’s good to have some pests in the organic garden because it promotes a healthy balance where more predators are attracted. Companion planting describes the placements of some plants for the benefit of others. It is used in three ways. Certain plants with strong scents help to confuse pests and others entice pests away from the crop. Some crops just grow well together, for example potatoes and sweetcorn. Many herbs are quite resistant to attack by insects and disease. They have strong smells and can confuse pests on the look out for food. A bed of chives planted round a plum tree can deter wasps, and prevent scab in apple trees, for example. Nasturtium flowers are very attractive to aphids, and planting them among strawberries or at the base of fruit trees will prevent aphids from attacking your fruit. They’ll feast on the nasturtiums instead. Plum trees are hungry feeders and benefit from legumes, such as peas and beans being planted around the base. Legumes’ roots fix nitrogen into the soil, which plums trees thrive on. Organic gardening is better for you, your children and the environment. It doesn’t take lot to switch from conventional methods, and once the garden is fully working your life will be much easier as the natural predators will do all the hard work for you. You’ll be rewarded with tastier, healthier fruit, so what’s stopping you?